Good grief! What is it with that Spam? I've blocked it and blocked it and it keeps coming back. Aggravation! I guess I might have to stick the word verification thing back up if it continues. Kay- I guess this is how some people keep themselves busy. I get more spam on the Email mailbox, and even after repeatedly hitting the "Report Spam" button, seems like the same senders get through. Ain't that big of a deal. As far as enabling "word verification," everybody has had to. 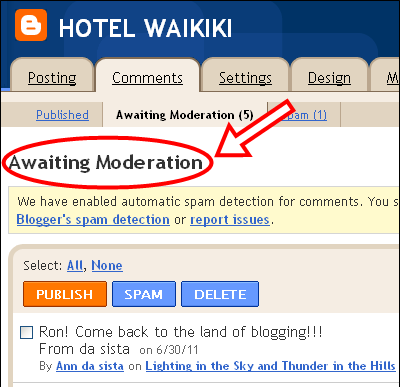 I have begun keeping a list of all the spam comments I get. One of these days I'll post the list on my blog. Some people need something else to do. Like go chop rocks or something. Mokihana- it's like trying to get rid of cockroaches. Some still seep through. I'm always asked to enter a word verification. Does everyone get that or is that just for family? Ann- geez, I dunno because I haven't yet visited here from an outside computer. What I do know is that I have to do the word verification on my own site. But it's off and on for me. I did enable word verification a while back after repeatedly receiving a barrage of spam in the comments section, so to my knowledge, it's still enabled for posters. Ann- btw, I don't "moderate' comments, which I think is ridiculous, unless you're exceptionally fragile, or publish the type of material that requires it. I WON A MILLION DOLLARS!! Brad- The relatives said you were rich. Just trying to humorous. kahuku- LOL, only a million? They can keep their money.